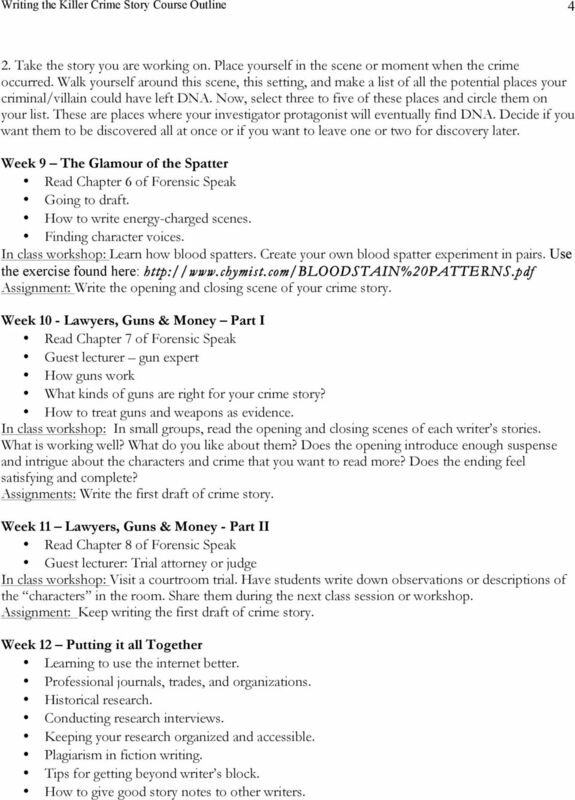 Download "Writing the Killer Crime Story Suggested Course Outline"
1 Writing the Killer Crime Story Course Outline 1 Writing the Killer Crime Story Suggested Course Outline Course Description: Learn how to create authentic and dramatic crime stories. Become an amateur CSI by delving into the study of forensic science. 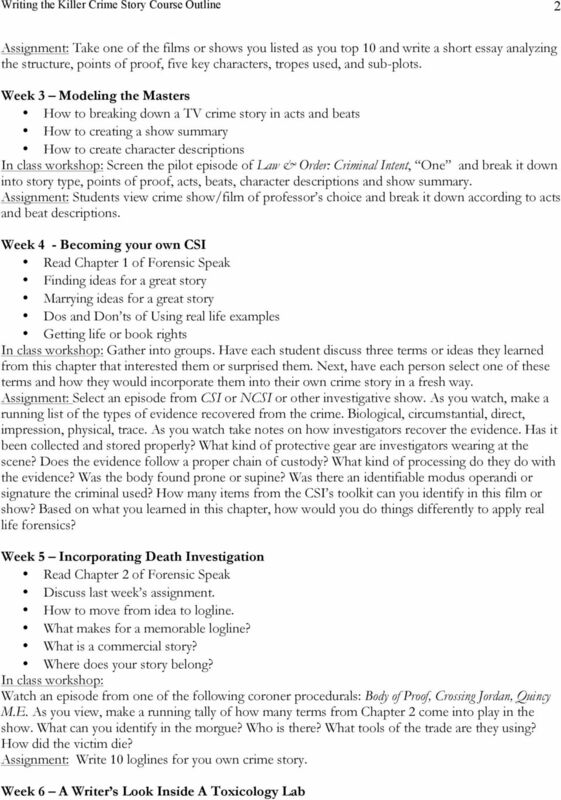 Course goals and objective: Students will: learn the fundamentals of crime dramas and apply them to their own crime story. 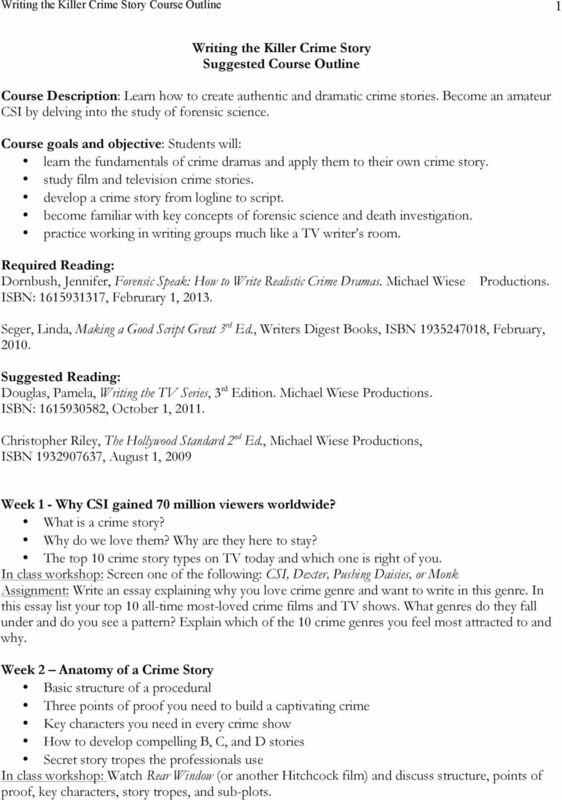 study film and television crime stories. develop a crime story from logline to script. become familiar with key concepts of forensic science and death investigation. practice working in writing groups much like a TV writer s room. Required Reading: Dornbush, Jennifer, Forensic Speak: How to Write Realistic Crime Dramas. Michael Wiese Productions. ISBN: , Februrary 1, Seger, Linda, Making a Good Script Great 3 rd Ed., Writers Digest Books, ISBN , February, Suggested Reading: Douglas, Pamela, Writing the TV Series, 3 rd Edition. Michael Wiese Productions. ISBN: , October 1, Christopher Riley, The Hollywood Standard 2 nd Ed., Michael Wiese Productions, ISBN , August 1, 2009 Week 1 - Why CSI gained 70 million viewers worldwide? What is a crime story? Why do we love them? Why are they here to stay? The top 10 crime story types on TV today and which one is right of you. 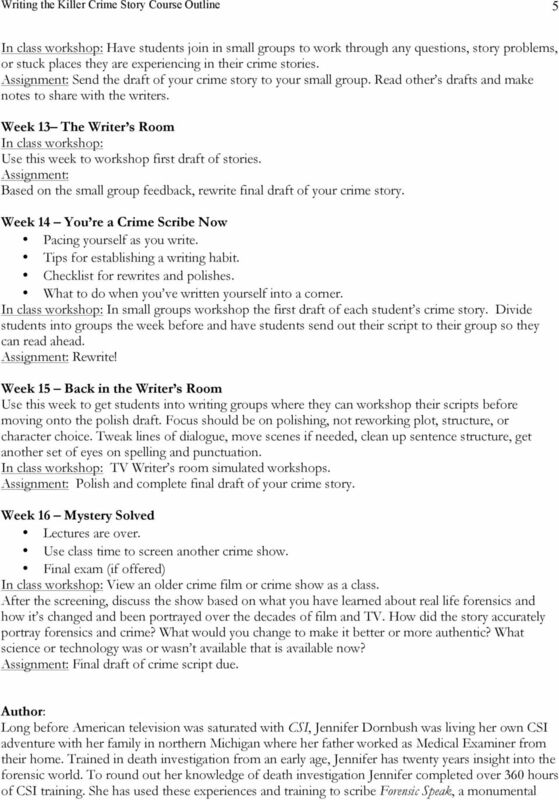 Screen one of the following: CSI, Dexter, Pushing Daisies, or Monk Assignment: Write an essay explaining why you love crime genre and want to write in this genre. In this essay list your top 10 all-time most-loved crime films and TV shows. What genres do they fall under and do you see a pattern? Explain which of the 10 crime genres you feel most attracted to and why. 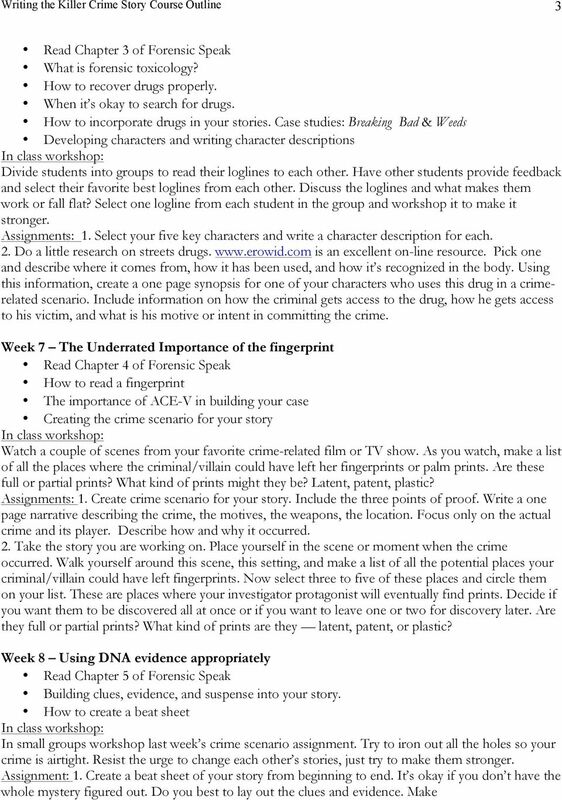 Week 2 Anatomy of a Crime Story Basic structure of a procedural Three points of proof you need to build a captivating crime Key characters you need in every crime show How to develop compelling B, C, and D stories Secret story tropes the professionals use Watch Rear Window (or another Hitchcock film) and discuss structure, points of proof, key characters, story tropes, and sub-plots. 4 Writing the Killer Crime Story Course Outline 4 2. Take the story you are working on. Place yourself in the scene or moment when the crime occurred. Walk yourself around this scene, this setting, and make a list of all the potential places your criminal/villain could have left DNA. Now, select three to five of these places and circle them on your list. These are places where your investigator protagonist will eventually find DNA. Decide if you want them to be discovered all at once or if you want to leave one or two for discovery later. Week 9 The Glamour of the Spatter Read Chapter 6 of Forensic Speak Going to draft. How to write energy-charged scenes. Finding character voices. Learn how blood spatters. Create your own blood spatter experiment in pairs. Use the exercise found here: Assignment: Write the opening and closing scene of your crime story. Week 10 - Lawyers, Guns & Money Part I Read Chapter 7 of Forensic Speak Guest lecturer gun expert How guns work What kinds of guns are right for your crime story? How to treat guns and weapons as evidence. In small groups, read the opening and closing scenes of each writer s stories. What is working well? What do you like about them? Does the opening introduce enough suspense and intrigue about the characters and crime that you want to read more? Does the ending feel satisfying and complete? Assignments: Write the first draft of crime story. Week 11 Lawyers, Guns & Money - Part II Read Chapter 8 of Forensic Speak Guest lecturer: Trial attorney or judge Visit a courtroom trial. Have students write down observations or descriptions of the characters in the room. Share them during the next class session or workshop. Assignment: Keep writing the first draft of crime story. Week 12 Putting it all Together Learning to use the internet better. Professional journals, trades, and organizations. Historical research. Conducting research interviews. Keeping your research organized and accessible. Plagiarism in fiction writing. Tips for getting beyond writer s block. How to give good story notes to other writers. Study critically acclaimed series to learn about the characters who drive them and the franchises which provide the external stories. rev Guide to Entering (and Winning) The Final Draft Big Break Screenwriting Contest! BFA: Digital Filmmaking Course Descriptions Video Editing Lab [07:211:100] In this course students will learn the fundamentals of video editing. Students will become proficient in one editing software.